Winter had returned! It was cold and overcast, but at least it wasn’t raining for our first day of our new adventure on the bikes. Fully loaded and dressed in about every winter item we had, including our thermals, we took the obligatory photo with Ian and Maddie and headed down the drive and out into a world that was entirely new to us. 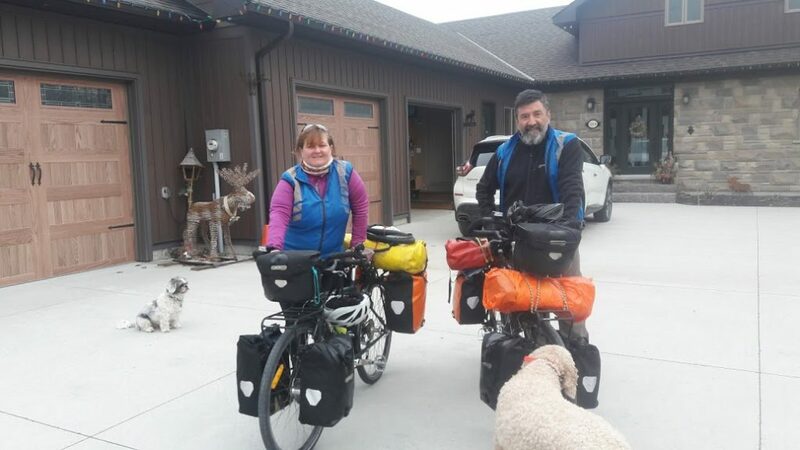 The bikes seemed sluggish at first, but that was just us adjusting to the load. We’d get used to it soon enough, we knew that. 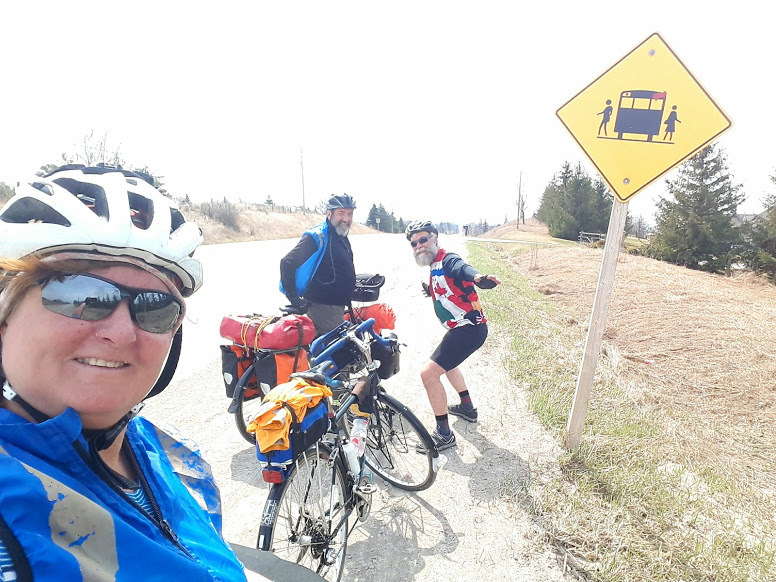 We had planned our first day out to be easy enough, incorporating a rail trail that ran about the last 16kms into Orillia. The back roads down past Coldwater were quiet, hardly any traffic at all. The landscape was still mostly colourless, just a few evergreens and the odd splash of colour from the few roadside houses we passed. 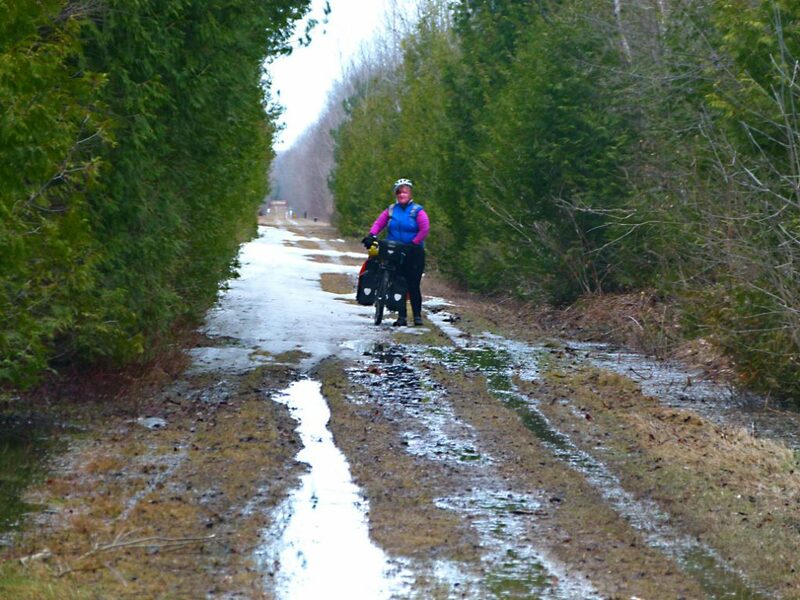 When we got the rail trail we could see a short stretch of unmelted ice covering its entire width. I had hoped that the sun would have done its job by now, but the trees either side of the trail had protected it and it remained iced over while the rest of the area around had melted and dried out. We rode up to it and surveyed the situation ahead of us. 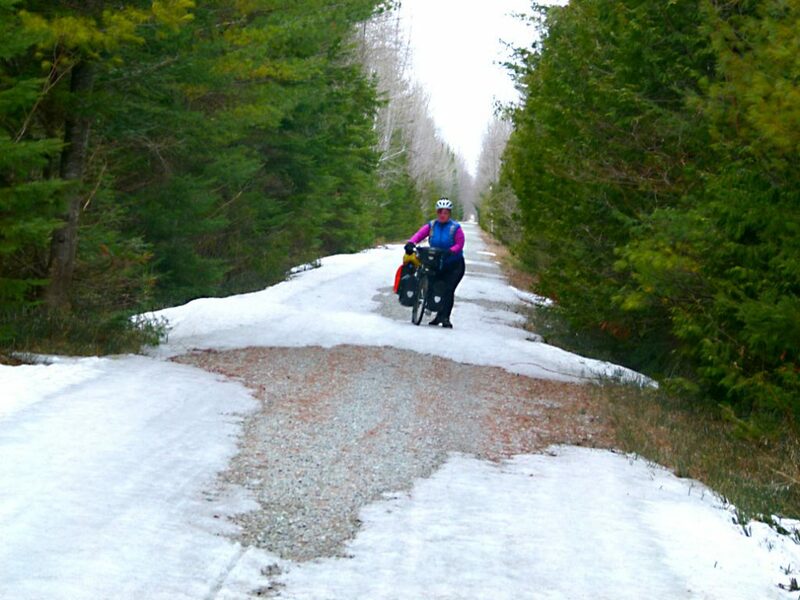 We would have to walk any sections covered in ice, it was too slippery to ride on, and, anyway the extra weight on the bikes would send them crashing through the top layer of ice and into the slush below. So onward we forged, through the slush and mud and slippery ice. We welcomed long sections of compacted gravel but found the newer gravel to be soft and loose and made for only a grinding progress. We hadn’t really planned for our first day out to be so demanding on us physically. 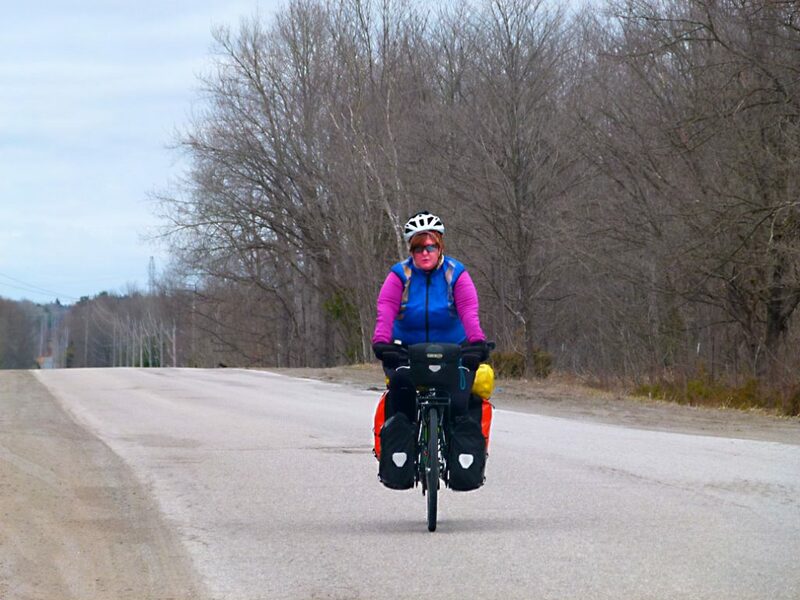 We were both nearly spent by the time the trail emptied out onto the highway north of Orillia. We decided to get back onto the road and immediately found it much easier going. And then there was mud! Just down the road, before a big hill, we discovered a small diner still open for lunch. This was the perfect opportunity to take a rest and eat something. The hot clam chowder worked a treat and the 2 ladies running the place had a great time chatting with us and listening to our accents (which, oddly enough, they loved!). They didn’t even care about the mud we dragged onto their front porch, at least we had tried to clean it off first, they said. From the diner, we headed over to Canadian Tire, a huge hardware chain here in Canada. We needed a gas bottle to cook with and a spare bungee cord as our old ones were quite frayed. 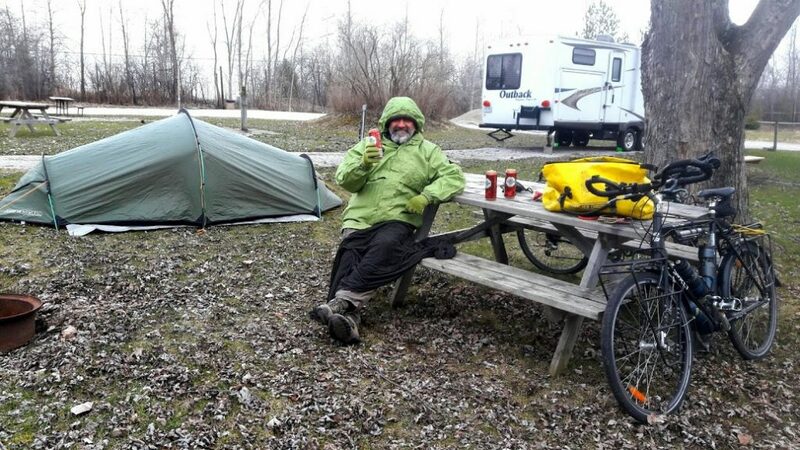 Our first campsite at Orillia, it was so cold! Our campground, Hammock Harbour, was just east of town and around the edge of Lake Couchiching. It was expensive for what we got ($…..), but we were worn out and cold. At least they put us close to the toilet block, which was heated. We had stopped in town to buy some dinner and a couple of beers, but now we had stopped cycling our bodies had cooled right down and we were freezing. We got the tent up quickly and, still fully dressed (except for our boots), we climbed into our sleeping bags and hoped sleep would come quickly. Overnight it dropped down to -7 degrees C, WELCOME TO THE RIDE!!! 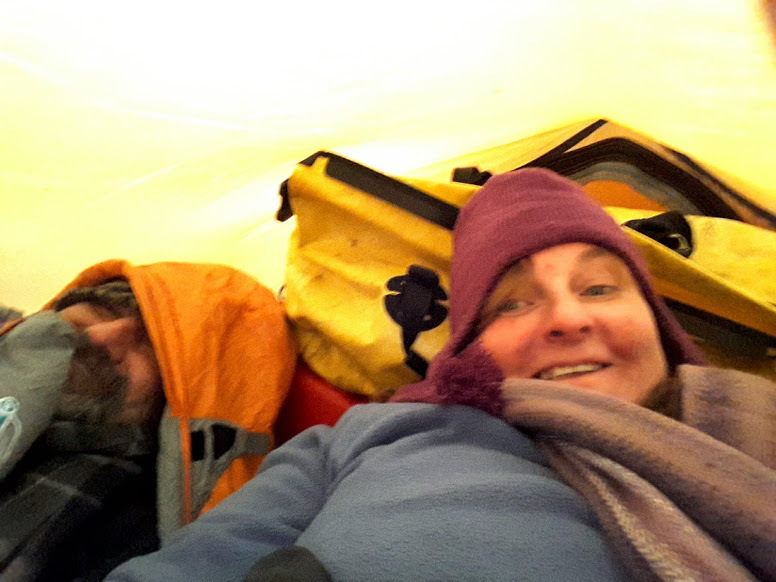 Freezing to death on our first night in the tent. It was -7 deg celsius! Our second day began briskly, it was a cold morning, but the sun had come out to greet us. We were headed to Beaverton on the other side of Lake Simcoe. We had booked an Airbnb on the lakeshore just outside of town. This would act as a halfway point on our trip to see our mate Rod Lewis who lived another day’s ride away at Mt Albert. 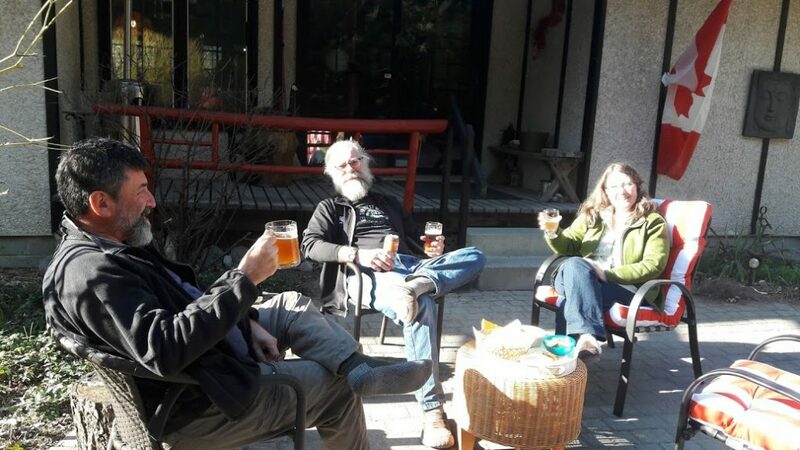 I’d met Rod on a Facebook group and we shared many common interests, especially good beer, music and, of course, bicycle touring. 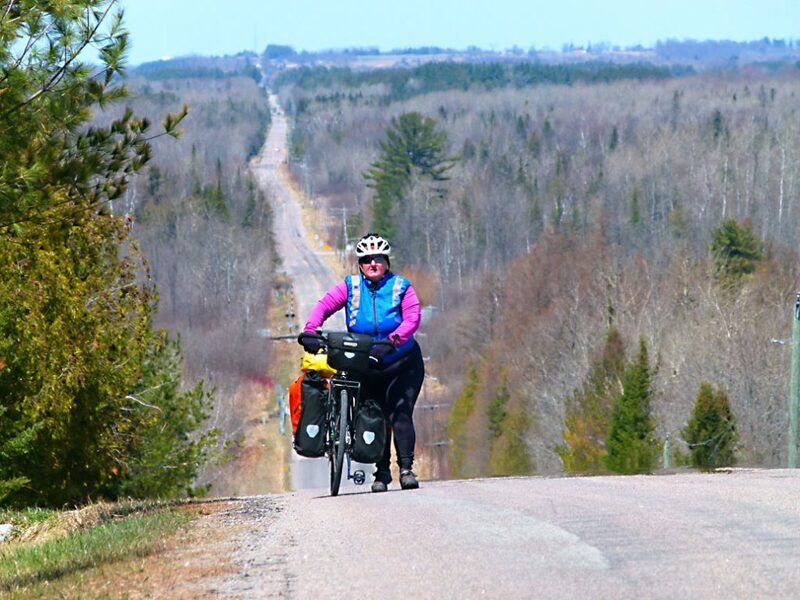 Our route took us along a dangerously busy stretch of Highway 6 at the top end of the lake. With little to no shoulder, we were relying on the drivers to do the right thing and leave some room for us as they sped by. Most obliged, but, as usual, the caravans and pickup truck drivers don’t move over for anyone! Fortunately, I’d found some back roads we could navigate and we managed to miss a large chunk of the highway. Joy and Dave, our Beaverton Airbnb hosts. What a great place! 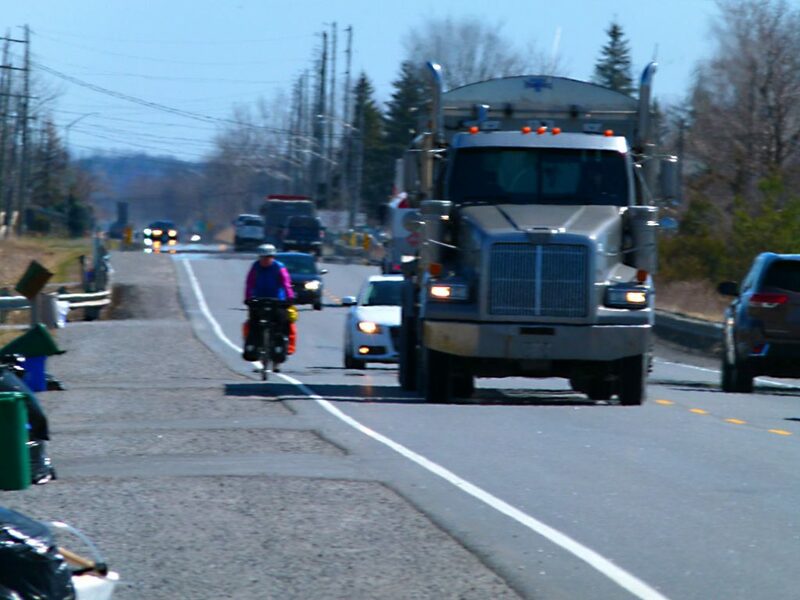 In Beaverton, we spoke to a rider who had cycled up from Toronto for the day (on a road bike of course!) and was preparing to cycle back. He pointed us to the main street where we found a small bar open who served wings. Once we’d filled up we cycled out to the Airbnb for the night. We were quite surprised when we pulled up, not sure if we’d come to the right place. It was a mansion! The multi-level house sat right on the lakeshore with its own jetty, a swimming pool and spa taking in the whole lake view. The owners, Dave and Joy were English and welcomed us with an awesome dinner and listened intently to our travel stories from around the world. 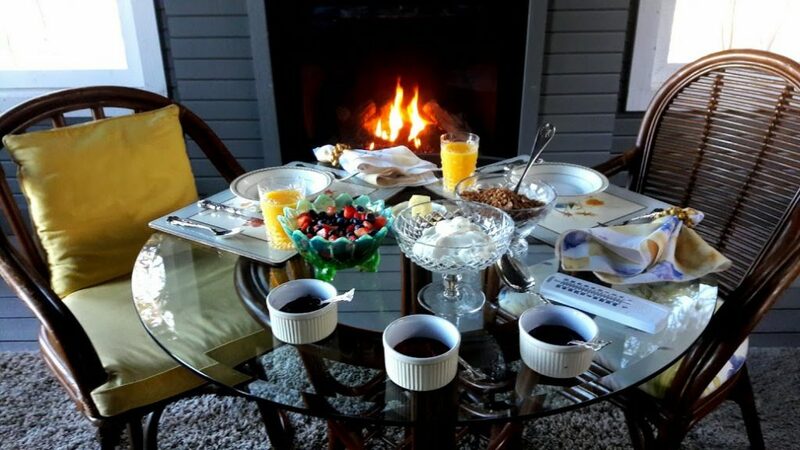 In the morning Dave prepared an enormous breakfast for us, better than a 5-star hotel and it was all included in the price. We had some great Airbnb experiences, but this was one of the best. After our huge breakfast, we headed out of Beaverton onto the 23, a mainly agricultural stretch, and followed it around to the 48. The traffic then picked up a few notches, in fact, quite a bit. There was more than the usual amount of truck traffic which made us a bit nervous and we were glad to eventually turn off it and head south. Heading south away from the lake, the land got very bumpy and we got our first real dose of hills. As we only had about 20kms left to Rod’s place, we attempted to cycle them all to the top without stopping. Surprisingly enough, we ground our way over each of them and were pretty happy with ourselves until the second to last hill, only half a km from Rod’s. This one went straight up and found us out. It was a good reminder of what lay ahead. How we will get over the Rockies is anyone’s guess, hopefully whatever lies ahead will prepare us for it. Rod lives at the top of one such hill and he had come out onto the road to make sure we found the place. He’s a very enthusiastic guy and had made a sign and placed it out on the road in front of his house. It read “Broken Hill to Mt. 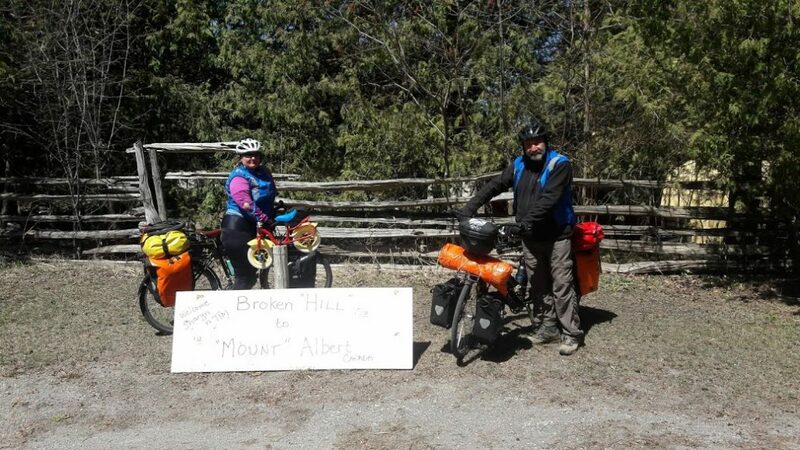 Albert – Welcome Tim and Sharyn” We were gobsmacked! What a bloke! With his long grey hair and beard, he’s perpetually caught in the ’60s, a hippy true to the cause! 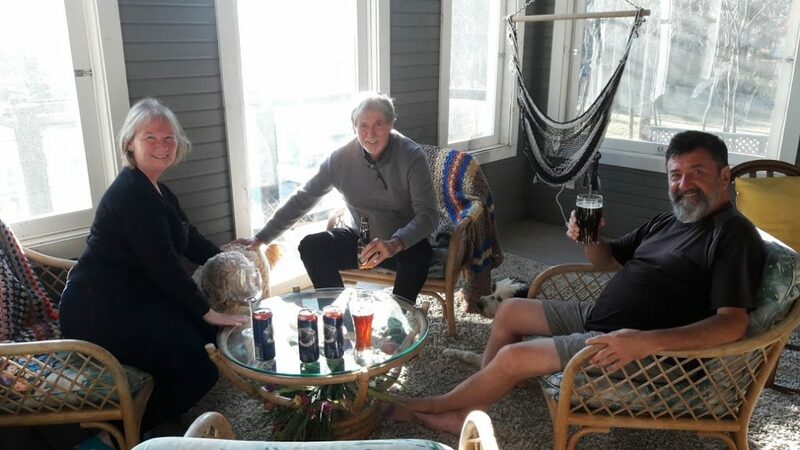 A music lover and craft beer lover, it wasn’t long before we cracked a few open and sat around in the sun getting better acquainted in front of his Japanese style house. He made us feel totally relaxed and at home. 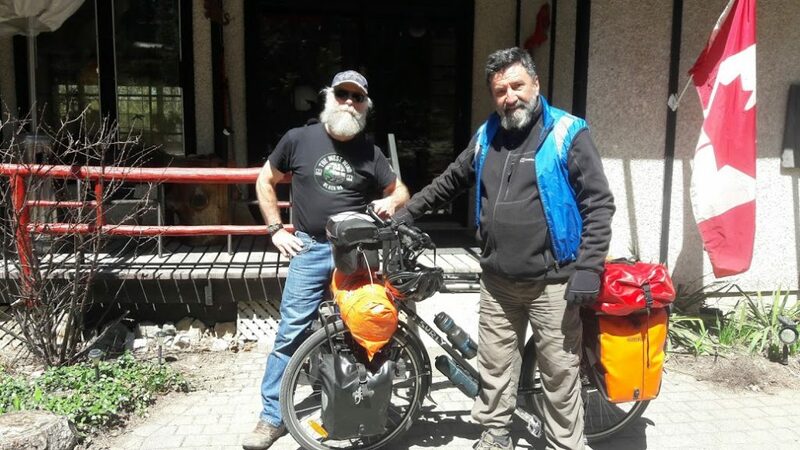 An avid bicycle rider, great sense of humour and a very proud Canadian, I felt very fortunate to have met up with this bloke. His wife, Alison joined us later and we knew we’d landed on our feet once again. We stayed with Rod and Alison for 2 nights. We gave the bikes a good clean and Rod bought out his best Maple Syrup and we did shots! Only in Canada! 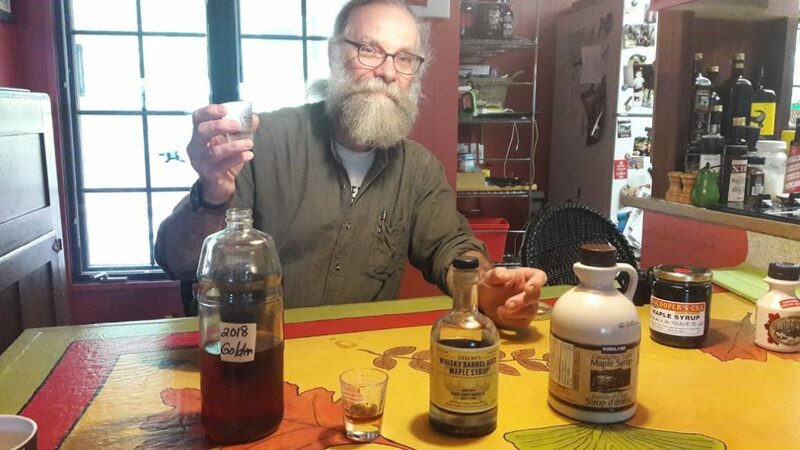 Doing Maple Syrup shots with Rod – Seriously!!! They drove us around the area and told us a bit about the history and current developments going on. A boom in real estate in the area had seen a rapid growth of housing developments that is stretching the infrastructure to its limits, especially water. We ended up at the biggest LCBO (Liquor Shop) we’d ever seen to stock up on Ontario craft beers – of which I’m now a big fan. Later we drove to Newmarket to the Market Brewing Company for dinner and a Trivia Quiz. We didn’t win, but we had a great time losing! Rod rode with us to the small town of Stouffville, directly south of Mt. Albert. It was up hill and down dale all the way. Fortunately, it was only 26kms. We had arranged another housesit with Galen and Tracey for 4 nights looking after their dogs Chilly and Petal. Galen ran his home business out of their beautifully restored Century house just one small block from the main street. We had gotten there a little early, so we headed to the Earl of Whitchurch, an English style pub up the road and amused some of the locals while we waited around. Like the guy he is, Rod rode with us to Stoufville, it was pretty hilly! There’s not a lot to do in Stouffville, and without a car we stayed home and walked the dogs twice a day and watched Netflix at night. 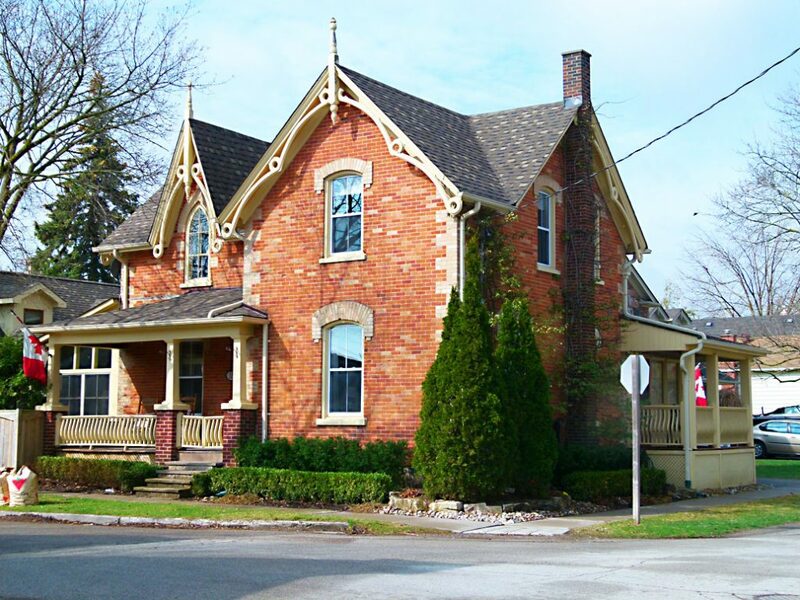 Our housesit in Stoufville, a renovated Century house – nice! 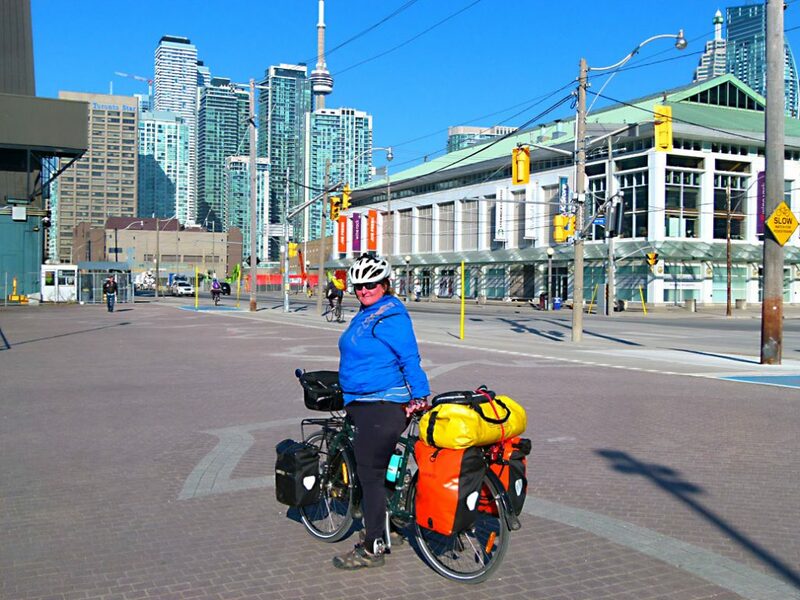 As cycling through the outer suburbs of Toronto was a bad idea (we were told), we put the bikes on the train and got out at Danforth Station. We had booked another Airbnb in Greektown for 1 night and headed straight there via some smaller roads that I had mapped out the previous night. Our room was on the 3rd floor, but thankfully we were allowed to leave the bikes in their living room, which they never used. Greektown was an eclectic area full of various nationalities and lots of different style cafes and restaurants. A youngish population provides the energy that is palpable and we were glad that we picked this place to stay. One thing we did notice though, was Toronto has a great cycling culture and the streets are well and truly shared. This made us feel more confident as we had to cycle through the downtown area tomorrow on our way to Burlington.